4life premier product, Transfer Factor Plus is the strongest immunity booster out of all the transfer factor formulas that we carry. * This formula boosts immune cells so that they can function at 437%. * Furthermore, thanks to new 4life-patented harvesting methods, Transfer Factor Plus is now also 25% more concentrated, improving absorption and efficacy. What sets Transfer Factor Plus Tri-Factor Apart? 4Life Research is the only medical entity that is patented to extract the Transfer Factor Molecule from chicken egg yolk and colostrums. 4Life has 11 pending or issued patents that include US patent 6,468,534 or Transfer Factors from chicken egg yolk and US patent 6,866,868 or manufacturing techniques that combine transfer factors from chicken egg yolks and cow colostrums. Why other Companies offer Transfer Factor on the cheap? 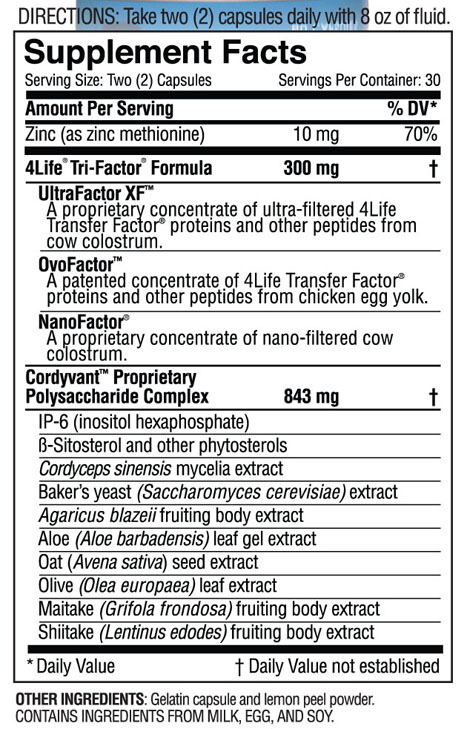 Unlike other products, Transfer Factor from 4Life is not Colostrum. Colostrum contains Transfer Factor naturally. Other products that claim to offer Transfer Factor only contain about 12.5 mg of what that is found in Colostrum. 4Life on the other hand provides 150 mg of pure Transfer Factor with no Colostrum. Studies have shown that both 4Life Transfer Factor ® and Transfer Factor Plus® Trifactor formulas boosts the ability of Natural killer cells by 283% to 437% when the body requires it. Cow Colostrum on the other hand is only known to boost the immune system by 26%. Transfer Factor products have also been recommended by The Russian Federation for clinics and hospitals. The recommendations are a direct result of two experimental studies and ten independent scientific trials that emphasized the benefits of Transfer Factor products from 4Life. Transfer Factor Plus – Tri-Factor not only promotes the energy levels and health of the human body but also supports to strengthen immu8ne system. * It contacts peptides that recognize potential threats, respond to them immediately and train the immune cells to carry out their job properly. Click the button below to add the Transfer Factor Plus * Free Shipping & Tax* to your wish list.